This online tool offers simple indicators on the RIS3 process by using data coming from social media sites, such as Twitter or Google trends with regards the overall process, or also allow for specific searches with keywords of key policies or programmes implemented in the region. Using natural language ontologies, it could allow for cross-regional comparisons or S3 social ‘interest’. However, the mapping exercise did not identify any pre-existing method that is relevant to describe social media analysis in RIS3. Current research on the use of social media analytics in public sector reveals indeed that “governments are just about to explore the opportunities that [are offered by] social media and the analysis of user-generated contents” (Grubmüller et al., 2013). This is particularly evident in the field of RIS3, in which the application of social media analytics has the potential to track and capture satisfaction of beneficiaries with the RIS3 process overall and increase collaboration. Indeed, according to the Joint Research Centre’s Institute for Prospective Technological Studies (Osimo, 2008; Pascu, 2008; Pascu et al. 2007; 2008), ICT-enabled solutions for the application of social media analytics can effectively support and facilitate the development and implementation process of Smart Specialisation Strategies. However, the lack of case studies and literature dealing with the use of this method in the context of Smart Specialisation Strategies makes it difficult to explore its practical implications. The tools developed by these projects are considered of great value to the ONLINE-S3 project because they highlight the potentials offered by the analysis of contents extracted by social media. Moreover, they provide useful knowledge and lessons on how to develop the ICT-driven services, tools and applications for RIS3 social media analytics which are going to populate the ONLINE Platform for Smart Specialisation Policy Advice. The project has produced a fully automated ICT-based SMA platform which allow decision-makers to analyse the vast amount of user-generated contents and opinions sourced from social media and blogs and use this data for supporting the development of public policies and strategies (http://cordis.europa.eu/project/rcn/102148_en.html). The architecture of the platform is shown in Figure 25 and its main components are the following: 1) Policy Modeling Tool; 2) Data Acquisition Module; 3) Linguistic Processing Pipeline; 4) Opinion Mining & Argument Extraction; 5) Argument Summarization; 6) Social Reaction Visualization (Charalabidis et al., 2012b). PADGETS has developed a prototype service for policy makers that uses social media technologies and techniques to: boost public engagement; enable cross-platform publishing and content tracking; and provide support to decision making. With the PADGETS platform, messages related to public policies can be disseminated simultaneously within multiple social media sites, but using a single integrated interface. This makes it possible to reach large user groups. Their feedback is then collected by the platform, that keeps track of and analyses the users’ reaction by each message (Ferro et al., 2010). This system can therefore empower “citizens to better participate in decision making processes and public deliberation of policies by increasing the impact of their opinions [and feedbacks] while dramatically reducing the effort and cost of projecting them in the public sphere” (http://www.padgets.eu). ImmigrationPolicy2.0 has developed and piloted “a range of citizen-centric services which facilitate the participation of citizens in the migration policy development process. […] The services support [the] drafting [of] immigration policy text, develop and test policy models, evaluate scenarios (“what-if” process), as well as harmonizing policy text”. Moreover, they facilitate “societal group of immigrants with migration background […] to get informed” and can be used to “evaluate various migration-related proposals and policies […]. The process [involved] the development of new models for citizens’ legal residents’ participation, as well as the collection and analysis of collaborative input from multiple citizens. The pilot services of the project [was] offered over a centralized, collaborative, trustful migration platform (conveniently called ImmigrationPolicy2.0 platform) enabling users (i.e. policy makers, politicians, decision makers, citizens) to identify, model, visualise, analyse and evaluate national migration policies, practices, monitor and accordingly harmonise easily their procedures and data formats relateding to their economic activities and documents involved (e.g. civil status documents i.e. (e.g. residence permits/certificates, work permits, civil status certificates, family unification certificates)” (http://cordis.europa.eu/project/rcn/191809_en.html). Puzzled by Policy aimed “to address the specific issue of immigration in a manner that likewise addresses the broader issue of widespread confusion about and disengagement from the policymaking process by providing all citizens [with] an informative and easy-to-use platform to engage topical policy issues”. To achieve this aim, the project’s team has developed, “tried and tested eParticipation […] tools such as EU Profiler and Debategraph with new widget applications to reduce the complexity of decision making at the EU level and ‘push’ the platform to popular social media sites such as Facebook and Twitter as well as to their own desk top and mobile devices” (http://www.puzzledbypolicy.eu). UniteEurope has developed a software that analyses social media contents related to migrant integration at the city level. “Through a sophisticated and automatized filtering of public social media contents, [this] tool [can] analyse migrant integration specific posts produced by citizens, communities, and organizations”. The software helps policy makers to “judge on current discussions on migrant integration issues; to proactively or reactively take actions; and to monitor effects on actions taken” (UniteEurope Consortium, 2014a). The UniteEurope tool supports sources of three different stream types: Twitter, Facebook and Google+ (UniteEurope Consortium, 2014b). Considering the usability and impact of social media analytics in the public sector, which are shown by the above-mentioned projects, the use of this method in relation to the design and implementation of Smart Specialisation Strategies can provides the governance system with the possibility to integrate valuable stakeholders’ insights, opinions and feedback, detect future trends, stimulate collaboration and support evidence-based decision making processes by taking public opinion into account. This method can also help increase transparency (United Nations – Department of Economic and Social Affairs, 2012; European Commission 2016). What is more, the World Bank (2012) reports that social media platforms generate higher public participation rates than other conventional e-government applications. These tools can play an even greater role in strengthening and widening the participation of and interaction with citizens (Charalabidis et al. 2012a; 2012b). Moreover, in the RIS3 context, social media analytics can help articulate the collaborative visioning process and better legitimate the selection of specific scenarios emerging during the strategy formulation. Moreover, even if this aspect does not significantly emerge from the projects previously discussed, when talking about using user-generated contents extracted from social media in the public sector and in the RIS3 development process, one major implication is privacy. This generates some fundamental concerns for public authorities “seeking to develop their own social media [groups] or strategies for engaging with other sites […]. Users willingly share their identities on social media sites such as Facebook and Twitter, yet this does not mean they do not care what happens to this information. Indeed, users have serious concerns about how secondary firms use their information as a source for data mining and surveillance […], and the extent to which social media sites passively facilitate or actively encourage these activities” (Kietzmann et al., 2011). This may result in legal actions for invasion of privacy (Kravets, 2010). The European project NOMAD (Policy Formulation and Validation through non-moderated crowdsourcing) offers a list of the 50 most used social media from which the user-generated contents can be collected (Xenakis et al., 2012). The list is reported in Table 7. 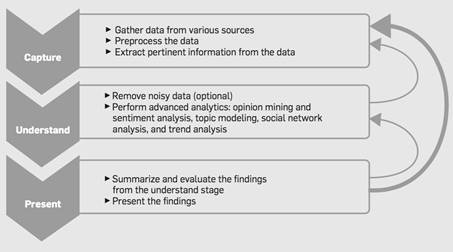 Considering that no case studies can be identified in which social media analytics has been used in the field of RIS3, this table represents a list of potential data sources to be considered and tested. A possible implementation roadmap for social media analytics in the development of RIS3 is presented in Figure 26 Social media analytics process. This roadmap is based on the analysis of the previous projects and research by Fan and Gordon (2014). ICT-enabled solutions for social media analytics can facilitate the development and implementation of this roadmap. Relevant social media data are obtained by monitoring or listening to various social-media sources. This stage “helps identify conversations on social media platforms related to” the RIS3 process and can cover “popular platforms (such as Facebook, Foursquare, Google+, LinkedIn, Pinterest, Twitter, Tumblr, and YouTube), as well as smaller, more specialized sources (such as Internet forums, blogs, microblogs, wikis, news sites, picture-sharing sites, podcasts, and social-bookmarking sites)”. Data collected from the selected sources is used to prepare a dataset which is going to be used in Phase 2. “Various preprocessing steps may be performed, including data modeling, data and record linking from different sources, stemming, part-of-speech tagging, feature extraction, and other syntactic and semantic operations that support analysis” (Fan and Gordon, 2014). After collecting the conversations related to the RIS3 process, their meaning needs to be assessed and the metrics for decision making needs to be developed. “Since the capture stage gathers data from many users and sources, a sizeable portion may be noisy and thus has to be removed prior to meaningful analysis. Simple, rule-based text classifiers or more sophisticated classifiers trained on labeled data may be used for this cleaning function. Assessing meaning from the cleaned data can involve statistical methods and other techniques derived from text and data mining, natural language processing, machine translation, and network analysis. The understand stage provides information about user sentiment and their behavior […]. Many useful metrics and trends about users can be produced in this stage, covering their backgrounds, interests, concerns, and networks of relationships” (Fan and Gordon, 2014). “The results from different analytics are summarized, evaluated, and shown to users in an easy-to-understand format. Visualization techniques may be used to present useful information; one commonly used interface design is the visual dashboard, which aggregates and displays information from multiple sources. Sophisticated visual analytics go beyond the simple display of information. By supporting customized views for different users, they help make sense of large amounts of information, including patterns that are more apparent to people than to machines. Data analysts and statisticians may add extra support” (Fan and Gordon, 2014). Askitas, N. (2015). Google Search Activity Data and Breaking Trends. Institute for the Study of Labor (IZA). https://ideas.repec.org/a/iza/izawol/journly2015n206.html. Accessed 18.11.2016. Bakhshi, H., & Mateos-Garcia, J. (2016). New Data for Innovation Policy. https://www.oecd.org/sti/106%20-%20Bakhshi%20and%20Mateos-Garcia%202016%20-%20New%20Data%20for%20Innovation%20Policy.pdf. Accessed 18.11.2016. Brainard, L., & Edlins, M. (2014). Top 10 U.S. Municipal Police Departments and Their Social Media Usage. American Review of Public Administration, 45(6), 728-745. Charalabidis, Y., Loukis, E., & Kleinfeld, R. (2012a). Towards a Rationalisation of Social Media Exploitation in Government Policy-Making Processes. European Journal of ePractice, 16, 77-93. Charalabidis, Y., Triantafillou, A., Karkaletsis, V., & Loukis, E. (2012b). Public Policy Formulation Through Non Moderated Crowdsourcing in Social Media. In E. Tambouris, A. Macintosh, & Ø. Sæbø (Eds. ), Electronic Participation: 4th IFIP WG 8.5 International Conference, EPart 2012, Kristiansand, Norway, September 3-5, 2012. Proceedings (pp. 156-169). New York: Springer. Collins, C., Hasan, S., & Ukkusuri, S. V. (2013). A Novel Transit Rider Satisfaction Metric: Rider Sentiments Measured From Online Social Media Data. Journal of Public Transportation, 16(2), 21-45. Dehghani, M., & Tumer, M. (2015). A Research on Effectiveness of Facebook Advertising on Enhancing Purchase Intention of Consumers. Computers in Human Behavior, 49, 597-600. Dehkharghani, R., Mercan, H., Javeed, A., & Saygin, Y. (2014). Sentimental Causal Rule Discovery From Twitter. Expert Systems with Applications, 41(10), 4950-4958. Ferro, E., Boero, R., Iosif, A., Gionis, G., Triantafyllou, A., Kallipolitis, L., Diamantopoulou, V., Charalabidis, Y., Maragoudakis, M., & Loukis, E. (2010). PADGETS: D2.1: Padget Design and Decision Model for Policy Making. Research Report of the PADGETS Project (European Union’s Seventh Framework Programme). http://cordis.europa.eu/docs/projects/cnect/0/248920/080/deliverables/001-PADGETSD21DesignDecisionModelV1.pdf. Accessed 18.11.2016. Gerber, M. S. (2014). Predicting Crime Using Twitter and Kernel Density Estimation. Decision Support Systems, 61, 115-125. Götsch, K., & Grubmüller, V. (2013). Web 2.0 for Local Policy and Decision Making Support Research & Development: Results From the ICT Project UniteEurope . In M. A. Wimmer, M. Janssen, A. Macintosh, H. Jochen Scholl, & E. Tambouris (Eds. ), Electronic Government and Electronic Participation: Joint Proceedings of Ongoing Research of IFIP EGOV and IFIP EPart 2013, Koblenz, 16 – 19 September 2013 (pp. 116-123). Bonn: Gesellschaft für Informatik. Grubmüller, V., Götsch, K., & Krieger, B. (2013). Social Media Analytics for Future Oriented Policy Making. European Journal of Futures Research, 1(20). Kravets, D. (2010). Judge Approves $9.5 Million Facebook ‘Beacon’ Accord. Wired. https://www.wired.com/2010/03/facebook-beacon-2/. Accessed 12.12.2016. Osimo, D. (2008). Web 2.0 in Government: Why and How?. Luxembourg: Office for Official Publications of the European Communities. Pascu, C. (2008). An Empirical Analysis of the Creation, Use and Adoption of Social Computing Applications. Luxembourg: Office for Official Publications of the European Communities. Pascu, C., Osimo, D., Turlea, G., Ulbrich, M., Punie, Y., & Burgelman, J. (2007). Social Computing: Implications for the EU Innovation Landscape. Foresight, 10(1), 37-52. United Nations – Department of Economic and Social Affairs (2012). E-Government Survey 2012: E-Government for the People. New York City, NY: United Nations. UniteEurope Consortium (2014a). 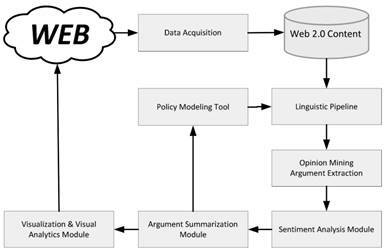 Supporting Local Integration Policies Through Scientific and Ethical Social Media Analytics: A Decision Support Tool for Evidence- Based and Sustainable Policies and Measures. Policy Brief of the UniteEurope Project (European Union’s Seventh Framework Programme). http://www.zara.or.at/_wp/wp-content/uploads/2014/09/UniteEurope_D7.8_Policy-brief.pdf. Accessed 18.11.2016. UniteEurope Consortium (2014b). 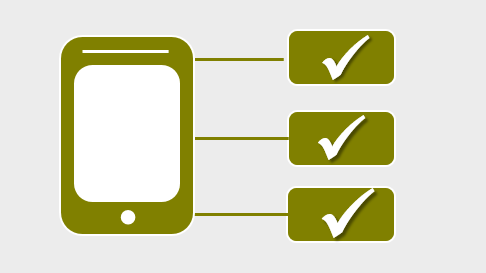 D5.10 – WP5: Application Development and Functionality. Report 2. Report of the UniteEurope Project (European Union’s Seventh Framework Programme). http://www.uniteeurope.org/images/deliverables/uniteeurope_d5.10_website.pdf. Accessed 12.12.2016. World Bank (2012). Information and Communications for Development 2012: Maximizing Mobile. Washington, DC: World Bank. Xenakis, A., Spiliotopoulou, L., Androutsopoulou, A., Koutras, C., Charalabidis, Y., Loukis, E., Christopoulos, G., Karkaletsis, V., Krithara, A., Scaltsas, D., Koryzis, D., & Triantafillou, A. (2012). NOMAD: D2.1 Classification of Web 2.0 Social Media and Stakeholder Characteristics. Research Report of the NOMAD Project (European Union’s Seventh Framework Programme). http://www.nomad-project.eu/Portals/0/d2.1_v1.0.pdf. Accessed 18.11.2016. Yang, M., & Rim, H. (2014). Identifying Interesting Twitter Contents Using Topical Analysis. Expert Systems with Applications, 41(9), 4330-4336.